Build Social Media Ads Instantly. Tap into Facebook and Instagram’s audience network without building ads by hand. Reach targeted audiences based on your specifications. Use custom and lookalike audiences to deliver the right ads to the right people. Carousel ads are built automatically using your MPOP® offers and promotions. Ads with relevant vehicle pricing increase click-through rates and lower cost-per-click to benchmark beating levels. Custom ad strategies for your market. Facebook and Instagram are valuable touchpoints along the online car buying journey. 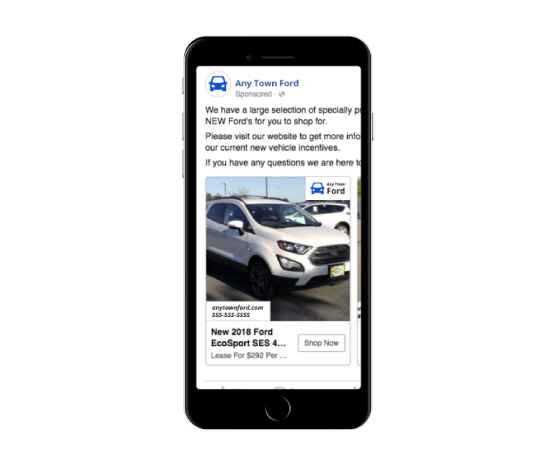 Car dealers can reach more shoppers with the right social media strategy. The patented MPOP® marketing platform delivers successful results, seamlessly.